"The Inca Trail is closed the month of February, from March 1 earnings will be reset to the Inca Trail with complete normality" The closure does not affect the Inca Trail to Machu Picchu tours other (Example: Train to Machu Picchu tours, Inca Trail Salkantay to Machu Picchu, walk through the jungle to Machu Picchu among others). where we will go see pictures que landscapes, until the Km 104 where we began our trek. From the archaeological site of "Chanchabamba" (2250 mts) went up by approx. 2 1 / 2 hours to the fascinating archaeological site of Wiñaywayna (2650 mts) where we enjoyed a picnic. In the afternoon we follow the semi-tropical forest to the "Intipunku" (the Gate of the Sun) of where we can enjoy the first panoramic view of the majestic Machu picchu. From here we descend by bus to Aguas Calientes where you can optionally visit the thermal baths and comfortably spend the night in a hostel can this be the Inka Tambo Hostal, Hostal Continental, Hostal Royal Garden, among others according to availability. After breakfast we went with the first bus to Machu Picchu to enjoy sunrise in this magical place before the arrival of other tourists from Cusco. Enjoy the tranquility of the lost city of the Incas on a guided tour, some free time. In the afternoon we went by bus to Aguas Calientes from where we return to Cusco by train. Transfer to Hotel. o Transfers from hotel to the train station. o Train ticket from Cusco to Km 104.
o Professional guide specializing in Inca Trail. o Admission to Hostel in Aguas Calientes. o Food (1 Breakfast, 1 Lunch, 1 Dinner). o Bus ticket Machupicchu-Aguas Calientes (round trip). o 1 Night Hotel (double room). o raincoat (or poncho plastic). o We recommend you bring appropriate clothing for sunny days. o Name: Agencia de Viajes y Turismo Inkas Herencia S.A.C. o The deposit must be sent under the name of INKAS HERENCIA S.A.C. (you can print this page). o Operation and transaction numbers. o Name of the bank where the transaction was done. 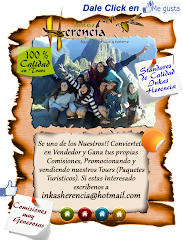 Etiquetas: Agency Travel, Cusco Peru, Inca Trail to Machu Picchu, Tourism Peru.